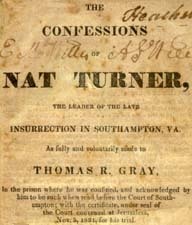 Nat Turner, 1800?-1831 The Confessions of Nat Turner, the Leader of the Late Insurrection in Southampton, Va.
Baltimore: T. R. Gray, 1831. African Americans -- Virginia -- Southampton County -- Biography. Slave insurrections -- Virginia -- Southampton County. Southampton County (Va.) -- History -- 19th century. Virginia -- History -- 1775-1865.